The characters of Nasreen Jahan’s stories are social misfits and discards, people who rarely attract attention because they are not charming or sophisticated, people whose stories are rarely told. Thus an old man rises from his grave to hunt down his wife’s killer; a cripple, mocked by everyone, tries to prove his virility; a cattle thief finds himself in rivalry with vultures. 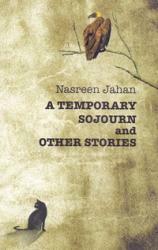 Strongly feminist in her outlook, Nasreen Jahan can also empathize with men who suffer discrimination and oppression. In her stories, the real merges with the surreal, as she narrates the cruel ironies of life, its sorrows and paradoxes. Told in a variety of voices and modes, using symbol and metaphor, the stories reflect upon the enigma of the existential human condition, trapped within fragile mortal limits. In these strangely compelling stories, the writer does not offer solutions or preach morals. Nothing is taboo. Even holy cows are not spared. As each tale edges towards its climax you forget you are reading and will have that eerie feeling that it is all unfolding right before your eyes but you have no idea how it will end. This is a rare gift for yarn spinners.